Trains and railroads, synonymous with both the Industrial Revolution and the Old West, were the transportation powerhouses of the 19th century. The 20th century, not so much – but that hasn’t stopped designers and engineers from conceiving ways the Iron Horse can get back in the saddle again. 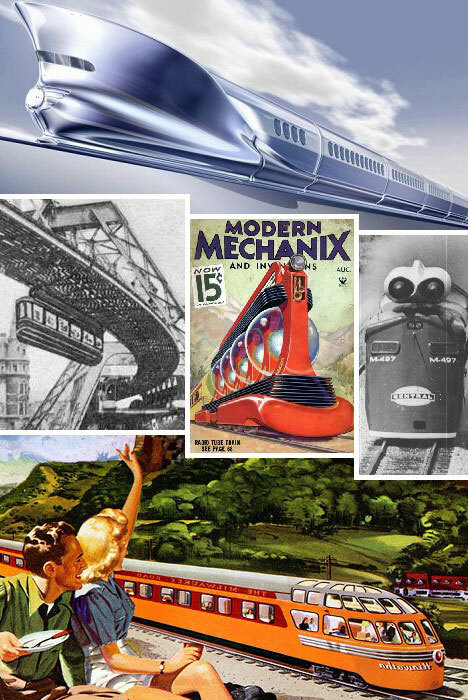 These ambitious concept trains move beyond the dream of steam to a new world of locomotive power. Clear the track, the train is back! Back when Britannia ruled the waves and cars had yet to hit the streets, the steel sinews of railroad tracks bound land and empire into the world’s penultimate power. Any future imaginings included bigger & better trains, such as the brassy selection above. 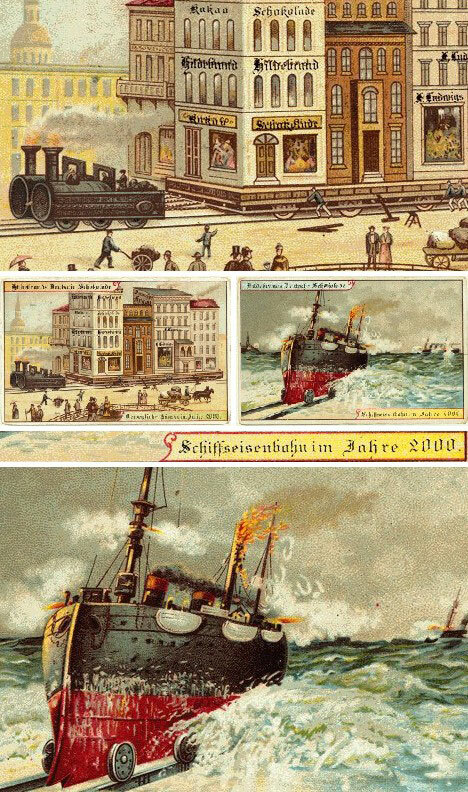 Hildebrands, a turn-of-the-20th-century German chocolate company, put out a series of amazing and amusing cards which attempted to predict the wonders of the world one hundred years in the future – but which actually seem to be a mere 10 years ahead, if that. 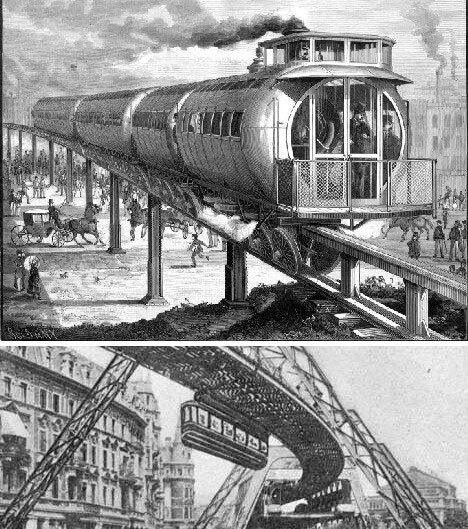 Of particular note are some trains that were expected to move entire city blocks and others which rode undersea rails to thus combine the advantages of train and ship travel. One can always rely on mid-20th-century pulp magazines to provide a glimpse of a utopian future. 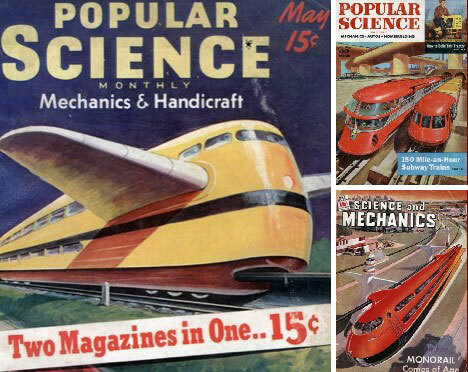 Popular Science was one of the leaders in this genre and their brightly colored covers were a window into an exciting future that just might be. 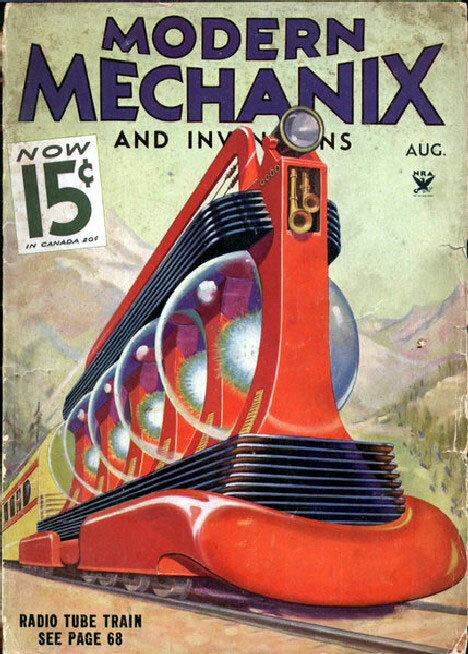 Modern Mechanix was another pseudo-scientific magazine of the Depression era that offered both the economically challenged and the nation’s idealistic youth a vision of better days to come. The Radio Tube Train shown in all its fire engine red glory dates from a time when anything seemed possible and hope was a very precious commodity. Across the globe, the USSR was firmly in the grip of Stalinism and idle day-dreaming was a luxury few could afford – or risk. Even so, a startling number of futuristic concepts were being circulated among the Russian populace by magazines like TM. 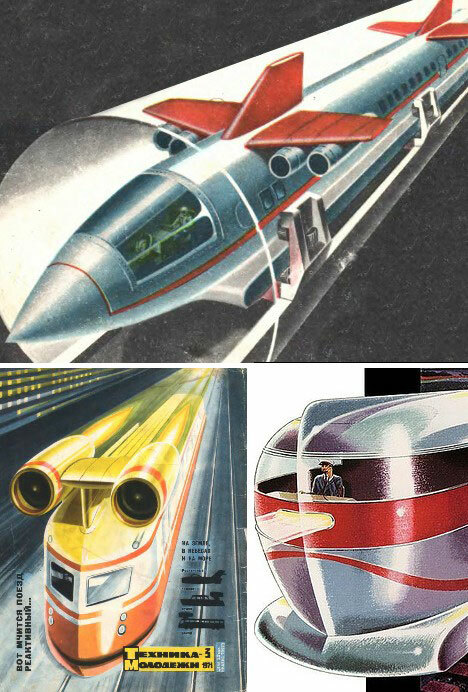 The train concepts shown above illustrate clearly that regardless of its popular image, the Soviet Union was far from bland & stodgy. A jet-powered train may seem to make sense in Russia – anything to speed up the dull commute from Omsk to Tomsk – but sudden stops to check papers were impractical to say the least. The concept was tried at least once, however, in 1970. A pair of turbojet engines from a Yakovlev Yak-40 passenger jet were bolted to a model ER22 locomotive, allowing the single car to reach a speed of 249kmh, or 180 mph. It’s obvious the bright yellow & orange jet train train featured in TM magazine was based on the Yak-powered locomotive. 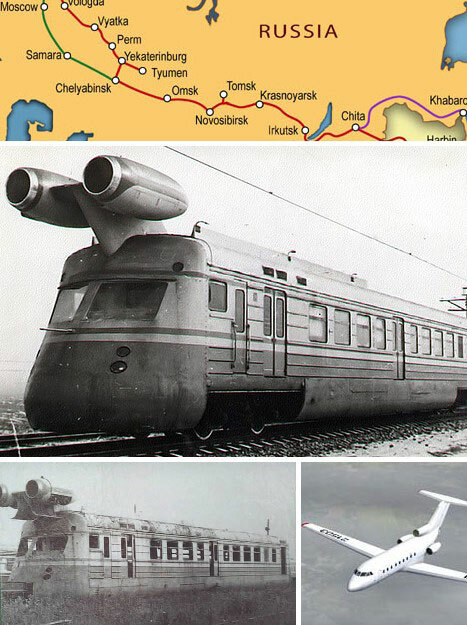 Let’s not be so quick to snicker at those wacky Russkies… where do you think they got the idea for a jet-powered train from, anyway? Yep, the good old USA. 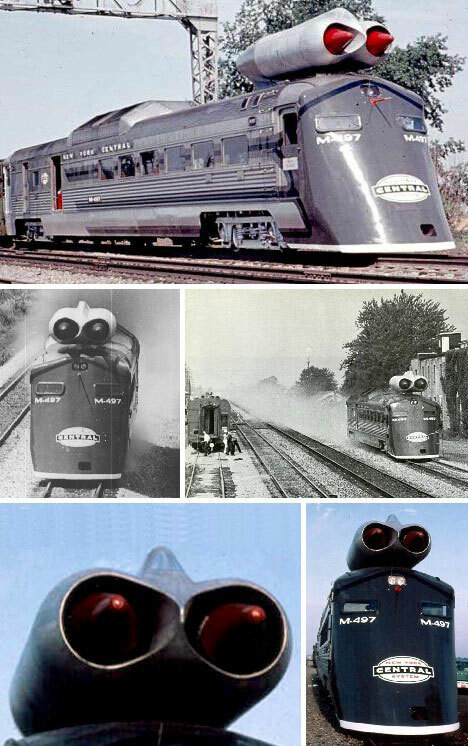 Travelers on the New York Central line back in 1966 may recall riding the “Black Beetle”, an odd combination of a specially customized Budd locomotive car and a twin-jet pod off a retired B-36 Peacemaker bomber. Odd or not, engine M-497 set an American rail speed record of 183.85 mph… a record that still stands some 43 years later. The M-497 was fast but looked slow; a generation earlier another famous concept train looked faster than it really was – even when standing still. 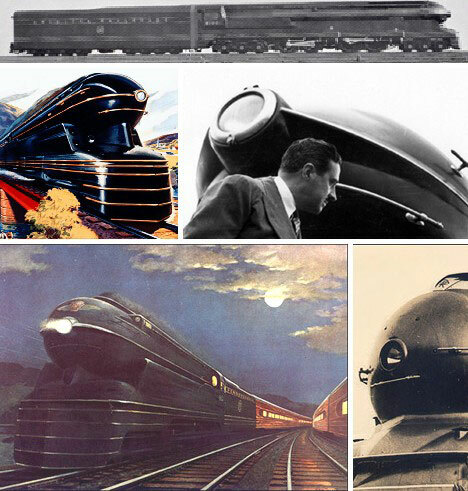 The shark-nosed, burnished black S1 train was designed in 1937 by Raymond Loewy, who would go on to design the 1953 Starlight Coupe and the 1963 Avanti for Studebaker. The S1 was the only 6-4-4-6 locomotive ever made, and wowed thousands when displayed at the 1939 New York World’s Fair. Train concepts aren’t necessarily far-fetched, some made it into limited production and were well-received by the public. One sterling example is the Hiawatha Olympian Sky Top, an innovative and stylish observation car designed by noted industrial & auto designer Brooks Stevens. 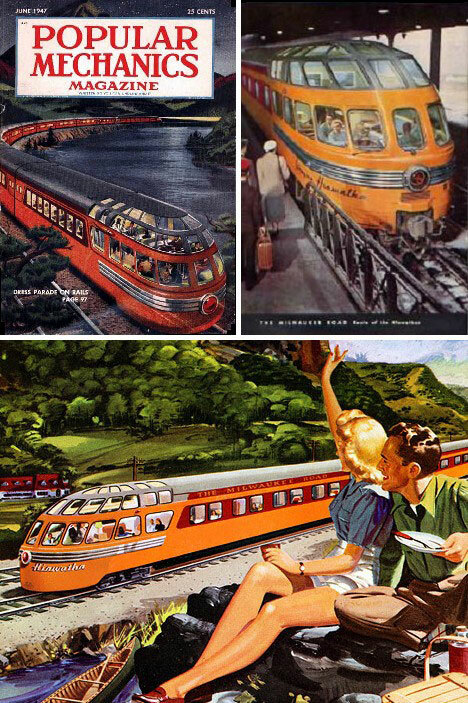 Six Sky Top cars were built by the Pullman company and were used on the scenic “Milwaukee Road” between Chicago and Tacoma, Washington from 1948 until 1961. Some of the cars were bought by the Canadian National Railway and were operated from 1964 through 1977. 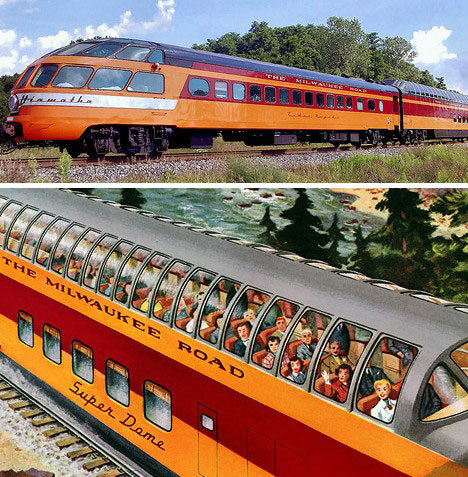 The Hiawatha trains also featured a spacious Super Dome car that offered passengers nearly 90 percent visibility through an arching dome of steel and glass. Did these cars heat up like rolling greenhouses on bright, sunny days? Did anyone care? It’s the Super Dome!! 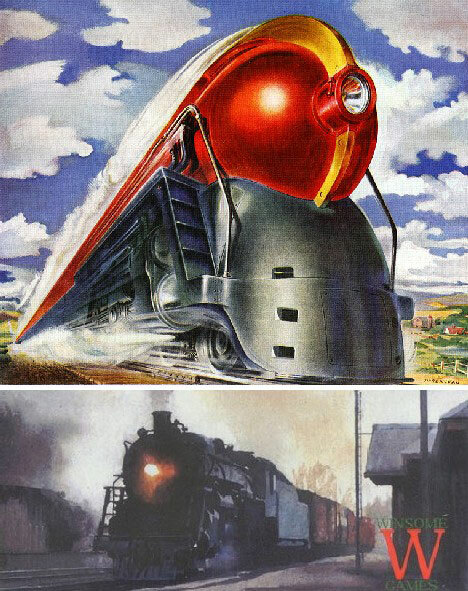 Maybe Superman was “more powerful than a locomotive” but listen my friend, locomotives of the post-war era were plenty powerful! The above “Cannonball 49” print displays in graphic terms the immense might of the railroads and the hold they had on the imagination. Why “Cannonball”? Maybe it has something to do with the Wabash Cannonball (above, bottom). While train travel and trains in general have gradually slipped from favor in the USA, in other nations it’s been just the opposite. Japan, especially, is a land ideally suited from train travel and the island nation’s railroad network is a model of efficiency. The stars of Japan’s railways are the fabled Shinkansen, or Bullet Trains, which began service in time for the 1964 Tokyo Olympic Games. 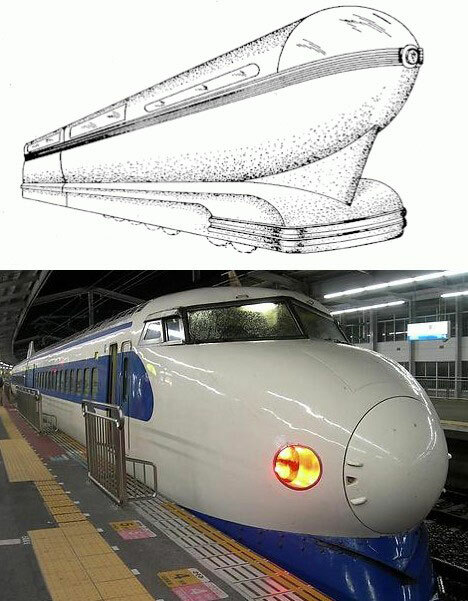 Few know that an American, George Walker (later a designer at Ford) was designing bullet trains 20 years earlier. 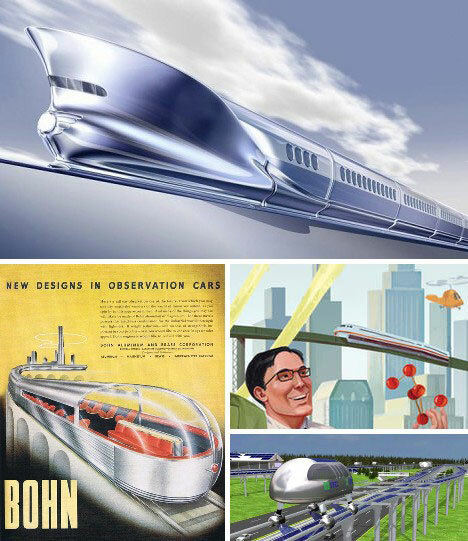 Note how Walker’s design study (above, top) anticipates the first series bullet trains just beneath it. 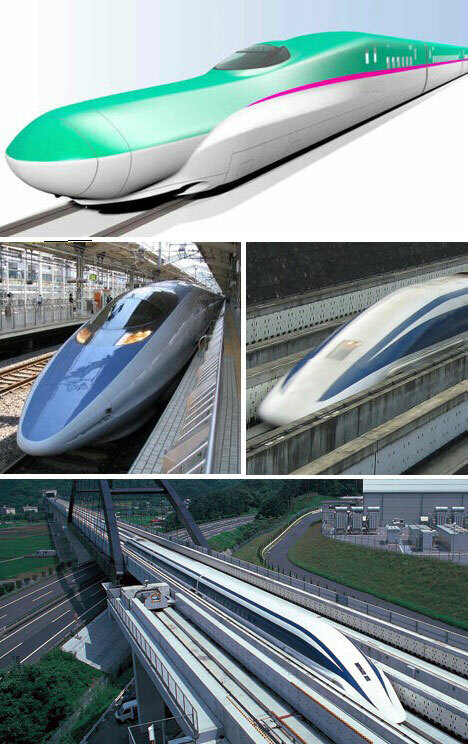 The newest bullet train, the E5 Series Shinkansen, was recently unveiled in concept form. The aluminum-alloy bodied E5 has a top speed of 320 kmh (200 mph) and is expected to enter service in the year 2011. As cool as this sounds, an even more advanced series of 500 kmh (360 mph) MagLev (magnetically levitated) trains is now in the testing stage in preparation for commercial use in the year 2525 – take that, Zager & Evans! One country already has a MagLev train in operation and it’s “speedily” stolen the hearts of riders. 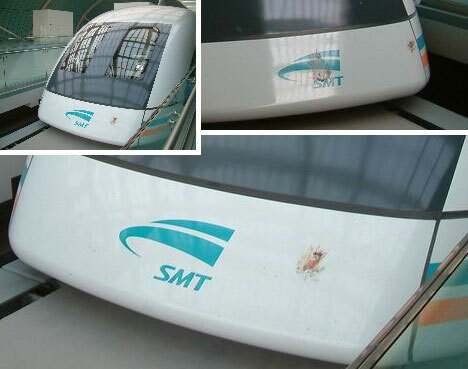 Construction began on the Beijing-Shanghai high speed rail line in the year 2000 and the first MagLev trains rolled – floated, actually – into service in March of 2004. Built with German technology for a staggering $1.2 billion and boasting a top speed of 431 kmh (267 mph), the Shanghai MagLev Train is the world’s fastest commercial train… in theory, at least. 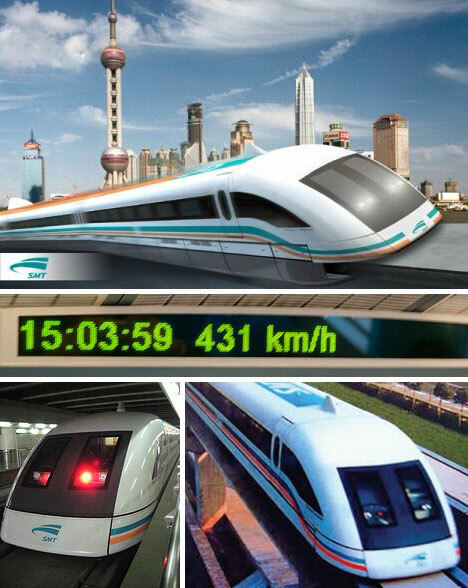 Since the current line connecting Shanghai’s main railroad station and international airport is only 30 km (18.5 miles) long, operational speeds on the MagLev line average just 245.5 kmh (152.5 mph). And what of the USA? Both the east and west coasts would appear to be prime bullet train territory. 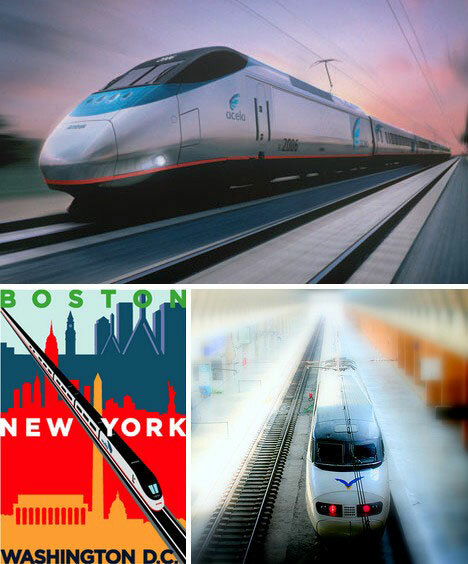 Currently the fastest American train is Amtrak’s Acela Express (above, top), limited to an average speed of only 68 mph (109 kmh) on the Boston to Washington, DC run though that includes rare bursts up to 150 mph (241 km/hr). Although their obituaries have been read time and time again, rumors of the death of rail travel are greatly exaggerated. Train technology and methodology has proven itself over the past 175 years and it’s track record can’t be beat. All aboooooaarrrd! !